Peoria is home to many newer active adult communities, including several that focus on golf as a lifestyle. Westbrook Village is where many area golfers get their shots in. Peoria is a suburban town northeast of Phoenix and Glendale in Arizona. The population grew over 30% in just a few years, currently about 157,000 call Peoria home. It is one of the furthest communities from Phoenix. The real estate crisis beginning in 2007 had a very hard effect on property here. After hitting bottom in 2011 at a median price of $100,000, prices have come roaring back. In early 2018, the Zillow Home Value Index was $271,167. There are several large active adult communities in the area including several of the original Sun City communities. One of the farthest suburbs from Phoenix. Today most of the city’s growth is taking place in northern and northwestern Peoria with many infill projects occurring in Old Town and southern Peoria.. 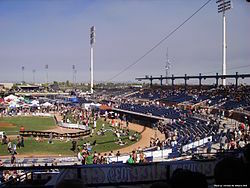 The Peoria Sports Complex was the first Major League Baseball spring training facility in the county shared by two teams. The San Diego Padres and Seattle Mariners utilize the complex year round for spring training and player development. In 2008 Money Magazine named Peoria one of the "Top 100 Places to Live". Average January temperature is 55 while the average July temperature is 94 degrees. Peoria Center for the Performing Arts is a very big attraction. For sports fans having spring training for 2 Major League Baseball teams is a very big deal. Trip Advisor lists a rather astonishing 225 restaurants with reviews in Peoria. Crime in Peoria is right underneath the national average. 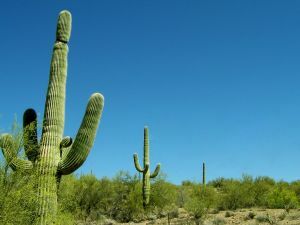 The nearest hospitals are in nearby Glendale and Phoenix, including Arrowhead , Banner Thunderbird Hospital, and Kindred. Phoenix Sky Harbour International Airport would be the largest airport nearby; Amtrak is in Phoenix about 11 miles from Peoria.